Well it is official as I received my business name registration certificate in the mail today! Please e-mail me at beck@bceng.com.au if you would like a class schedule sent to you. I have been busily working over the last month to set this all up and apologise to my blog followers for the lack of new posts over this time. The following classes are the first that will commence as of next month. Kits can also be purchased of the classes once they have been run. 'Sneak Peak' of the Christmas Time layout. In this class you will be creating this layout to display some of your new Christmas photos! 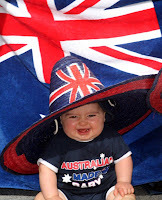 It suits both a boy or girl family or couple photos. 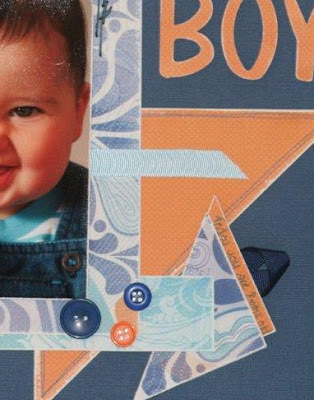 You will be using embellishment to jazz up what is an easy layout to re-create! 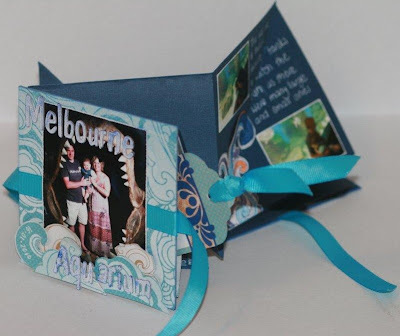 In this class you will be using Kaisercraft 'Off Shore' paper range and embellishments to make a mini album approx 10cm x 10cm which, when open, is larger than a 12 x 12 layout. It is great fun putting it together and even more fun opening and closing it. The paper is well suited to water themes such as a day at the beach, pool or bath time. 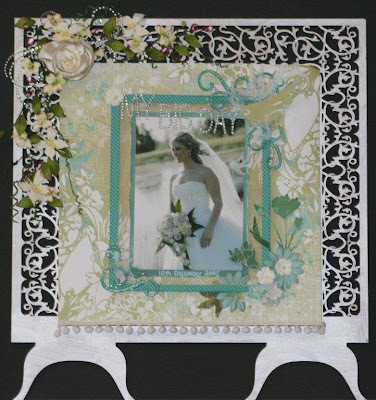 In this class you will be recreating this 12 x 12 layout. You will be learning about distressing using sanding; hand and machine stitching (and don't worry all you non sewers, we are starting rather simple with this one), as well as using ink to re-create a sanded look. This layout could suit both a boy or girl, as there will be both lettering options. In this class you will be decorating this beautiful easel from Twiddleybitz using exquisite embellishments by Prima. You have the choice of making the small easel or the large easel. The small easel will fit an 8 x 8 layout displayed, while the large easel will fit a 12 x 12 layout. In this class you will be applying layering and shown how to get the most out of Prima flowers and vines. This piece will make a great addition to your house or as a gift to someone special. Class times available are: Tuesday Day & Wednesday Night, Thursday Night, and occasional Saturdays. Spaces are limited. Bookings and payment will need to be made prior to the night. On this night you can also view the full class pieces for that month and upcoming months (as these are completed). For those not participating in the crop, you are more than welcome to drop in between 6-8pm to view the upcoming classes in real life on this night, just e-mail me prior so we know to expect you. I really am looking forward to meeting some new people, so please don't be afraid to come along on your own to either the crop or a class. It will be a great way meet some other Scrappers! !